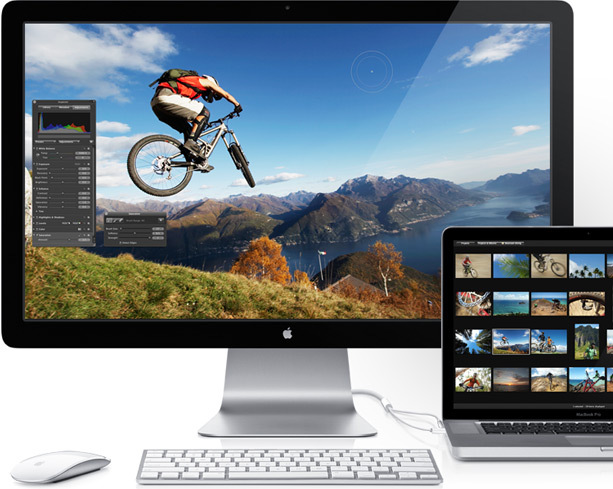 Tapscape has been informed that the new Apple 27″ Thunderbolt displays are shipping to stores and resellers this week. The glossy widescreen LED-backlit displays replace the old Apple HD Cinema displays, and feature a 2560 x 1440 resolution with Thunderbolt technology, which allows data transfer speeds up to 10x faster than Firewire. The 27″ displays come loaded with two Thunderbolt ports, three USB ports, one Firewire 800 port, one Gigabit Ethernet port, a 2.1 speaker system and built-in HD camera for FaceTime. The new cable combines a mag-safe power connector with the Thunderbolt connection, which means you can transform your notebook into a desktop solution with just one cord. The Apple Thunderbolt display is currently available for pre-order, with shipping for existing orders expected to follow shortly.